1. Sharon's (notimetostamp) Stamp Simply challenge to use a heart in your creation. 2. Tosh's (Stamps4funinca) Verve challenge to make a shaped card. I used my topnote die for my shape. 3. A DDC challenge I gave our group last week to use the grid (faux tile) technique. Details are in the resources section on this technique. I first scored my faux tile onto my cardstock, stamped the Linen bg the heart image from Boatloads of Love on my paper, and then sponged pink pirouette, creamy caramel, and ridinghood red as indicated. 4. Today's SCS sketch challenge hosted by cerridwen! If you'd like to participate in the Doubledog Dare Challenge, you can get the details in post #56 here. We'd love to have you join us! Just be sure to put DDC in your keyword so we can find your card! Have a great evening! I'm off to do some stamping after a grueling day at work! Beautiful, Charlene! Love your top note card! 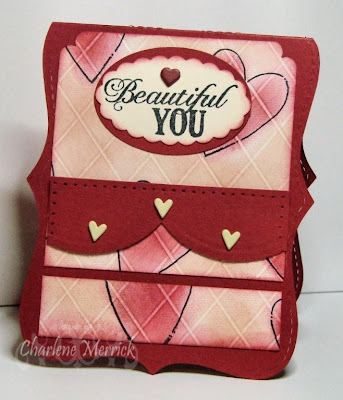 Very pretty and a great Valentine card. How did I miss this? Outstanding. You are so good! What a beauty! What a neat challenge idea to combine other challenges! This is too cute! LOVE those big scallops across the middle! Holy cow! I can't even count to 4 much less to four challenges in one! I can however yell....FOUR!!! !...on the golf course! Giggle! This is so awesome Bertie....Good job!